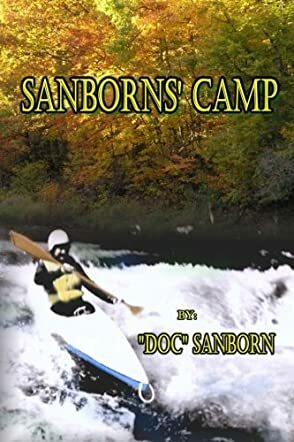 Sanborns' Camp is a memoir written by Doc Sanborn. Doc's great grandfather, Elihu Sanborn, decided that he really wanted to be a carpenter instead of following in his father's footsteps and working the family farm in New Hampshire. As he was the second son, this worked out just fine for Ezra, his father, who set him up as an apprentice to an older carpenter, who became Elihu's mentor and second father. On a trip home, Ezra mentioned to Elihu that a neighbor was planning on building a fishing camp on Newfound Lake and needed a carpenter. Elihu visited the Hardies, met his future wife, and began working on the project. The family fishing camp was situated on a spit of land that extended out into the lake and was accessible only by a dirt road. Successive generations of Sanborns would make weekend pilgrimages to the camp and spend long, lazy summers there. Doc Sanborn's memoir Sanborns' Camp is much more than a memoir. It's a family saga that stretches over a hundred years, and the reader gets to watch as young Sanborns serve in the World Wars, grow up, and bring their children to the camp. It's a rhapsody about nature and a simpler way of living. It's also very much a coming of age story about the author and his life with his grandmother and grandfather, who raised him after his parents divorced. We watch as he becomes old enough to help with the annual repair work done on the dirt road, and as he trains at distance swimming under the eagle eye of his grandfather to earn the right to row around the entire lake. I particularly enjoyed the passages about Mr. Fisher, the ageless and enigmatic neighbor who mentored generations of young Sanborns, and who taught the author the science and physics of how things worked. I can still hear the quiet 'chuga, chuga' of his motor boat. This is a marvelous book, filled with nature and magical images of a family boating, swimming, and living naturally and it's a compelling read. It's highly recommended.